Samsung on Thursday announced the Galaxy S4 and we’ll tell you everything there is to know about the device, leaving the theatrics at the door – that’s right, Samsung, that Galaxy S4 introduction was definitely strange. What’s important is that the Galaxy S4 is here, and ready to launch in 155 countries at the end of April. In what follows we’re going to tell you everything there is to know about the device, from specs to new software features to launch details and pricing. From the get-go it’s important to notice that while the Galaxy S4 has some interesting hardware under the hood, Samsung actually focused more on the new software features that will be found on top of the Google’s Jelly Bean – and yes, we can say that this time around we had a pretty good idea of what the Galaxy S4 would offer both in terms of specs but also new features. Dual Camera: the person taking the picture or recording a video can also be placed in either of them. It also works during video calls. S Translator: translate between nine supported languages (English US, English UK, French, German, Italian, Chinese, Japanese, Korean, Brazilian Portuguese, Italian). The feature includes voice-to-text and text-to-voice support, and it’s able to perform translations of image contents. It works both offline and online. S Health: manage your fitness exercises by pairing the smartphone with additional accessories including the S band, Body Scale or a heart-rate monitor. Samsung Knox: use the smartphone as an enterprise solution and balance work and personal features in a two-phones-in-one style. The feature will be available on other Samsung smartphones. Smart Switch: backup Galaxy S4 data on computers. Support for moving between any smartphone to the Galaxy S4 is included. In addition to the S band S Health accessory we mentioned earlier you should know that the Galaxy S4 will have a variety of other accessories including cases and covers. You can expect Flip Covers in a variety of colors, but also a new S View Cover that has an opening which will let you see the screen and control the phone even while it’s mostly covered by the rest of the case. Also worth mentioning is that the Galaxy S4 will work with gloves on, without requiring any special gloves to let you control the display in winter. As we have already told you, the Galaxy S4 should hit a variety of markets in late April. The handset will ship in 155 countries, from 327 carriers, but Samsung was not willing to actually reveal any exact launch dates. Furthermore, the phone doesn’t have an official price yet, but we can tell you it will ship in three capacity versions (16GB/32GB/64GB) and two color options (black and white) initially. 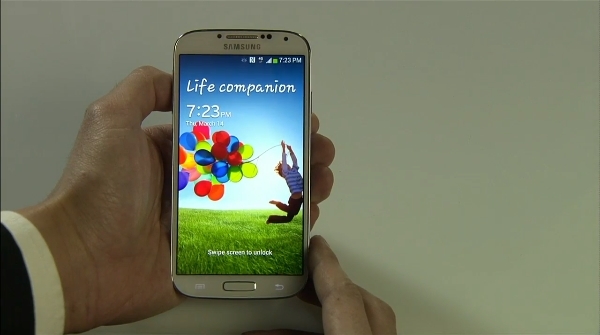 We’ll be back with more details about the Galaxy S4’s launch once we have release dates for various markets.